Anthony Gillam wrote to the Foundation to help fund the cost of an irrigation system helping improve the club status and extend its popularity in the area. In 2011 the club was nearly closed due to lack of members and no working mower. Having moved to the area and being keen bowler Anthony took it upon myself to try and turn the club around. He successfully applied to the LJC for funding towards a new mower which together with a loan from Criftins Parish Hall resulted in the improvement of the bowling green to competition standard. In 2012 the club organised a fundraising competition to raise more money, it was hugely successful which allowed repayment of the loan from Criftins Parish Hall. 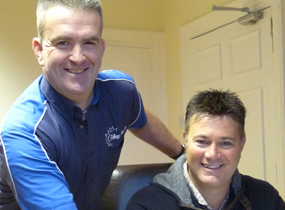 The Club now has three teams in the Oswestry Bowling League. During 2012 the A team, won Division One and the D team who won Division Four. A great achievement from a club with only 30 members. With this success The Criftins Bowling Club has become very popular with the juniors in the village and also in Ellesmere. Anthony said "2013 brings such promise an in the coming season we are entering an additional team into the Oswestry League consisting of primarily the juniors of the club to give them the experience in competition and also etiquette of the game. Most importantly giving them a safe environment and keeping them off the streets. I believe that with Criftins Bowling Club offering free membership to juniors and the introduction of a new team we will be even more popular this season. We are very grateful to the foundation for their contribution and look forward to welcoming new players young and old "
The foundation recently paid for the new furniture at the Oswestry Youth cafe and also for much needed electrical wiring tests. Ian Wilson from the cafe remarked " We would like to thank the foundation again for their continued support, and truly appreciate the donation". Deana Pennington from Shropshire Council Leisure Services, wrote to the Foundation to ask for a donation towards Grotto Games – an annual event for children and young people in Shropshire. Grotto Games gives children and young people the opportunity to participate in a variety of activities including: arts & crafts, sports and giant games. They also have the chance to see Santa for a gift and get in those last minute wishes! Deana says "the popular annual event aims to get the community together to enjoy a host of activities, whilst raising the awareness of how 'play' is an important building block in a child's healthy and active lifestyle". The foundation are pleased to be able to support the funding of young cricketing star Jeska Ward. Jeska has played cricket for Wales for 2 years, and has been selected as part of their squad to go to Dubai in February 2013 for a competition. 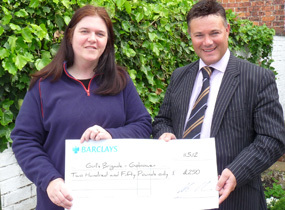 Jeska was granted £400 to help towards the cost of the trip. The foundation are pleased to be able to support the funding of a Jailbreak project for the girl guiding company of Prees, Whitchurch in Europe 2013. Jailbreak provides an opportunity for young girls to face personal challenges whilst travelling across Europe. It starts in the UK the girls have to plan their own way visiting three countries whilst completing given challenges along the way. The project will develop organisational skills, team work and give the girls the opportunity of face new experiences such as flying for the first time. The lucky girls invited to take part are Rebecca Furber, Jessica Roberts, Lauren Bond, Shannon Davies and Helen Chadwick and are all local to North Shropshire. Sarah Davies, qualified leader for 1st Prees Senior section said "Many girls in Girlgiuiding never get the opportunity to take part in these activities due to the financial costs. We are trying to raise funds to help enable this trip to go ahead and give some girls frorm the local area of a chance to do something they would never have thought the were able to do. For us to be able to do this we need to raise in total £4,800 for all participants to take part. We are currently actively fundraising with activities such as bag packing in Tesco's, Whitchurch, disco's, guess the name of the teddy and are hoping to arrange a fashion show, but to name a few. 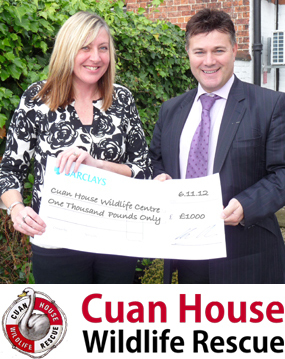 We are most grateful to the foundation in getting the ball rolling with their generous donation of £500"
Cuan House Wildlife Rescue is a small registered charity based in Much Wenlock Shropshire. It is dedicated to the rescue, care and rehabilitation of sick, injured and orphaned wild animals and birds. The charity is the only one of it's kind that offers 24/7 response in Shropshire and each year regularly admits and treats approximately 1500 casualties. One of the Charities aims is to advance the education of the public in the care and rehabilitation of wildlife and firmly believes that believes that today's youngsters are tomorrow's future. Consequently the centre will be looking to further educate young people in caring for wildlife and the environment. To promote such education, Volunteers from Cuan House Wildlife Rescue regularly visit schools, colleges and community groups, such as Brownies, Guides and Scouts. The charity receives no government funding and depends on the generosity of individuals, companies and groups and currently needs to raise over £50,000 to cover the day-to-day running costs. The money donated by the Charlotte Hartey Foundation will be put towards the cost of building a much needed new aviary. Fund-raising coordinative Mandy Day said " She was so grateful to the Foundation for their generosity". Mandy promises to keep the foundation updated with the development. Sheelagh Weir wrote to the foundation to ask for a donation of £500 towards the recent repair work that has been carried out on the West Kirby District Guides headquarters. The Building was erected in 1974 and is used for meetings and training by members of Girl Guiding. It is used by 200 local children, aged 5 to 18, and run by volunteer adult leaders. The building is also equipped for children (brownies etc.) to come and stay for short periods including guide members from the more deprived areas of Wirral and Liverpool. This gives them the opportunity to enjoy a holiday in West Kirby. Although the building is structurally sound, unfortunately the roof has now come to the end of its economic life and needed replacing. At present, it is not insulated, with consequent heat loss, it leaks at times and was manufactured with old cement panels. The total cost of the project was £16,000 but it is now £22,000. This is due to additional health and safety works and also having to renew the gutters and facias at the same time. Sheelagh and the guides had managed to raise £18,000 through grants and fund raising but had to borrow £4000 to complete the project. Sheelagh said "We are holding many more fund raising activities, such as coffee mornings and bag packing events to help repay the loan as soon as possible. We are so grateful to the Foundation for their contribution and generosity." Amy wrote to the foundation to ask for help with the cost of travelling from her home town Shrewsbury to the Midlands to fulfil her dreams of one day playing for England Ladies Football Team. Amy has been a keen footballer since the early age of six after watching her brother play for their local football team. After a season of watching her brothers team and practising she managed to start training with the boys club aged 7. After showing her skills in goal she was soon was picked to play for their first team. Since then there has been no stopping Amy's pasion for the sport. 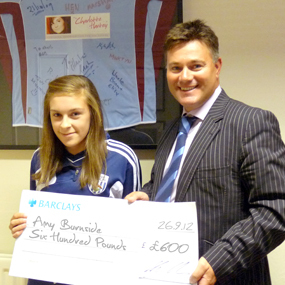 Amy soon progressed to Shrewsbury and played for them for 5 years. In 2011/12 she played for Stoke and is delighted to now be playing for West Brom. Her parents have thoroughly supported her enthusiasm throughout her career but as petrol prices have soared over the last 5 years, they have found it increasingly difficult to pay for the cost of travelling twice a week for training and games. Alison Burnside, Amy's mother said "Last year we travelled 6883 miles and spent £1071 in petrol alone, and are so very grateful to the Foundation for their generous donation of £600 towards the cost of supporting Amy"
Karl Hartey, patron of the Foundation said "We wish Amy all the very best in her career, and are so pleased to be able to step in with a simple grant help towards travelling costs. It would be such a shame to quash Amy's enthusiasm over the rising price of petrol." 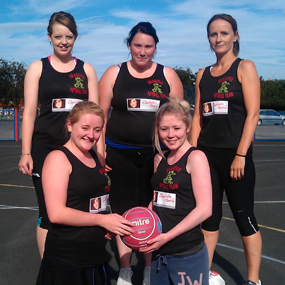 The foundation were please to help purchase the kit for the "Dragons" netball team. Natalie Bathers approached the foundation for the sponsorship and said " she was really pleased that the foundation were able to help, and we are very grateful for the donation." We wish the girls all the very best in the forthcoming season. 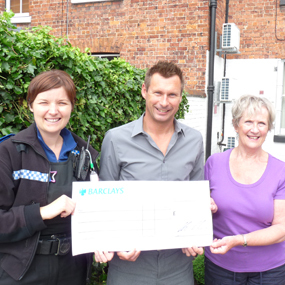 The project received £600 from the St Oswald and Llanymynech LJC and £200 from the Charlotte Hartey Foundation, with £300 match funding being secured through positive youth activities team and the police in partnership. Ramped is a very clear project programme that teaches young people health and safety, provides safe competitions, 3 youth workers for a full day from 10-4, the day allows non skaters to come along and learn and teach tricks with bikes and equipment provided. The programme also provides information on the maintenance of bikes and light refreshments throughout the day. There are some great links here with police initiatives particularly in providing advice to young people about safety on bikes during summer holidays as well as an opportunity for the police to build relations with young people in the area. The Foundation are please to help sponsor Morda United Football Club for a second year running. 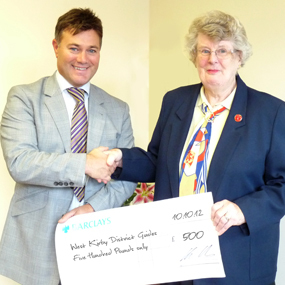 After a successful 2011 season the foundation was only to pleased to be able to sponsor the team for 2012 by gifting £500. Craig Rogers said " The club was very grateful to the Foundation for their continued support for a second season." The Foundation was pleased to be able to supply a commemorative tree plaque to mark the Queens Diamond Jubilee on 5th June 2012. 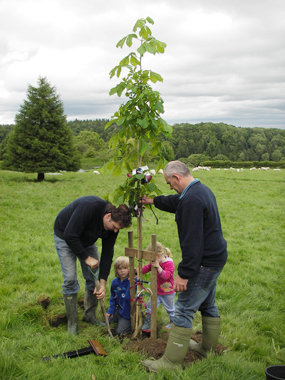 Juliet MacKenzie approached the foundation for the funding for the plaque to mark the planted Horse Chestnut Tree at Bronygath, Nr Oswestry. Juliet and Helen Lloyd jointly organised a wonderful Village Jubilee Party that took place during the weekend. Juliet said " The location of the Tree is truly wonderful; it looks like it was naturally grown, in the field Pont Faen side of Pentre Farm. Children will frequently pass the tree going to and from the village and will remember it as the Diamond Jubilee tree." The foundation are pleased to help with funding the cost of coach travel to the Shropshire District Annual fair at Edgmond Hall Centre, Newport. Carol Duncan 1st Officer - of the Gobowen Girls Brigade said "The money the foundation has gifted more than covers the Travel Cost. We are so grateful for the Foundation for helping make the weekend an affordable one for all those attending." 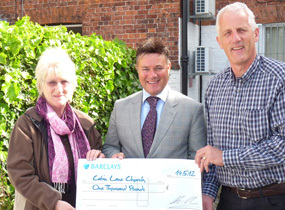 The Charlotte Hartey Foundation recently made an award of £1,000, to ensure work will soon begin on the installation of a children’s play area within the new community garden which is currently being completed on land behind the Whole Life Christian Centre in Cabin Lane. Carol Thompson, spokesman for the Whole Life Christian Centre garden project, said, “We are delighted that The Charlotte Hartey Foundation have chosen to assist us in creating this resource which will soon be available to the community. Their support has been invaluable and we thank them for the sterling work they do in raising much needed funds for local charities." 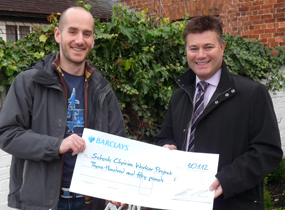 The foundation is pleased to help towards the cost of the Christian "Man - up" weekend by gifting £350. The project is the brainchild of the local Schools Christian worker Ben Mayho and aims to teach positive core values and highlight the importance of honesty, responsibility for actions, and generally being an all round good guy to young men of the area. The weekend will teach a small group of teenagers (15+) to embrace the idea of 'Manhood' and promote responsibility as a good thing. Ben said "We don't want to take to fun out of being a teenager, but instead encourage the young lads to look forward to becoming real men. We want to show that being a 'real man' is something to aspire to - hopefully avoiding them spending a lifetime of sitting on the sofa playing computer games, then wondering why they don't have a girlfriend or a responsible job." The weekend will be led by family men who have experience of getting things both right and wrong who can offer not only Biblical teaching on responsibility, but real life experience in a variety of situations. The weekend takes place on the 3rd and 4th March at The Quinta, Weston Rhyn, Nr Oswestry. If you would like more information please call Ben on 07866 859428. 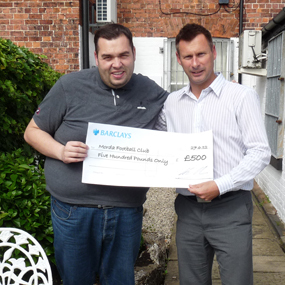 We are please to be able to provide Nik Pickering's latest venture by gifting him £500. The Bike Doctor, commonly known in the area for providing a mobile bike maintenance service has formed a downhill and cross training team. Nik has pledged to sponsor three hopeful cyclists for the season by providing cycle servicing and on site support when at competitions. We wish the team every success and look forward to hearing from the team in the near future. Nick said "Thank you so much for your overwhelming generosity. The lads and I are over the moon and will keep in touch with our news."